"UpTheTower arrived all okay in Tasmania and lives up to expectations as a good reference source. Thanks for a very valuable book." "The book arrived in today's mail...it's absolutely WONDERFUL." "I have just finished reading your new book Up the Tower for the third time. I keep re-reading it to make sure that I am not missing any of the pieces of great advice. I think that the book is 'super.' 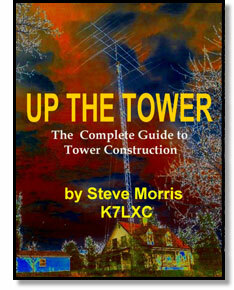 The book is concisely written and covers just about any question that you could have with regard to tower installation." "Received book and it is great. Thanks a lot." "I just received my Up The Tower copy and am thrilled. I've got lots of reading and learning ahead of me. Thanks for an informative book." "Your new book is a great collection of valuable information all in one place. This is essential reading for anyone thinking of their first tower project! And tower-experienced hams will also learn some new things." "Obviously a great deal of research involved. I will use it as a reference book." Hire Someone Or Do It Yourself? ** International shipping is not calculated automatically, and will be added to your order later. NØAX and K7LXC are at it again - this time it's HF multiband verticals. Now you can read an unbiased report on how they really performed. 2nd Edition. This groundbreaking test took ten HF triband antennas and tested their on-the-air performance. This is real live vapor wrap used by commercial installers on all outside RF connections. Made of butyl rubber, this is superior to CoaxSeal. Each package contains one sheet, each 3" by 36"".